The commitment to give 0.7% of national income in aid was first made in 1970. In October 1970, the UN General Assembly adopted a resolution including the goal that: “Each economically advanced country will progressively increase its official development assistance […] and will exert its best efforts to reach a minimum net amount of 0.7% of its gross national product […] by the middle of the Decade.” DAC members generally accepted the 0.7% target, at least as a long-term aim, with some notable exceptions. The US stated that it did not subscribe to specific targets or timetables, although it supported the resolution’s more general aims. Also, Switzerland – which joined the UN in 2002 – did not adopt the target. Prior to 1993, gross national product (GNP) was used, but a change to international economic accounting saw this substituted with gross national income (GNI). 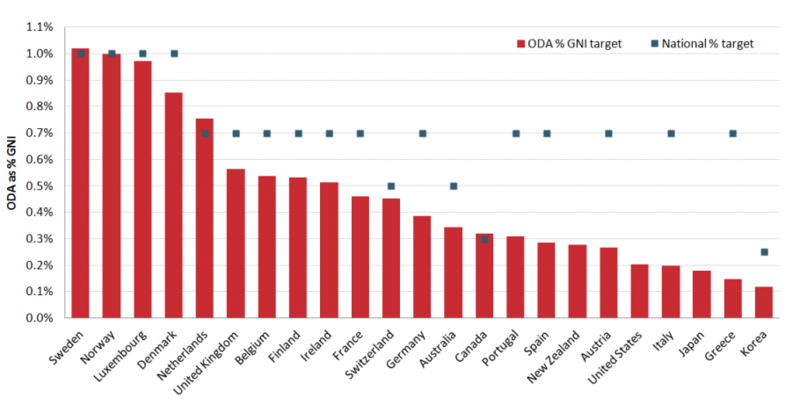 Only six countries have ever met the target, and the OECD average has never exceeded 0.4%. The first countries met the target in 1975 Sweden (which has met it in 1974 before GNP revisions saw it fall just short) and, , the Netherlands. Norway and Denmark reached it in 1976 and 1978 respectively. These four countries have continued to meet the 0.7% since. Finland achieved the target in one year, 1991, and Luxembourg has met it since 2000. The UK is expected to join this group and meet the 0.7% target in 2013. While some countries, including France had met the target in years before the threshold was set, no other DAC country has met the target since it was established. Sweden, Norway, Luxembourg, Denmark and the Netherlands have all consistently reached or exceeded the 0.7% target. While many countries have not met the original 0.7% commitment, some have made various national commitments to reach this or other levels. For example, the EU has pledged to meet 0.7% by 2015, while Australia has pledged to reach 0.5% by 2017/2018 (though the recently elected government is yet to announce its plans). Sweden, Norway, Luxembourg and Denmark have also consistently exceeded their own national targets (of 1%). By contrast Greece, Italy, Spain, Japan and the US give less than 0.2% in aid – as does Korea, although it only joined the DAC in 2010 and has set a national target of 0.25% by 2015.